Indian dishes are rich in flavour, texture, and aroma, and most of this can be accredited to the assortment of spices used. Although most spices can be found in local supermarkets, some might only be available at South Asian grocery stores. If you are unable to find a certain spice or ingredient, simply omit it. It might change the taste slightly, but the essence of the dish will remain intact. Adjust the recipes to suit your tastes and make them your own... Happy cooking! 1. Preheat oven to 350 C.
2. Prepare chicken for marinating by combining all ingredients in a large bowl. Put yellow color first to achieve an egg yellow tint in the sauce, and then add red color a little at a time until you achieve a rich and dark orange color. Mix well. 3. Spread chicken out in a baking dish, trying not to let the pieces overlap. Bake for about 20 mins or until chicken is cooked through and the sauce has dried considerably. 5. Note: The closest substitute for kasoori methi is celery leaves. 1. Heat oil in a pan, add onions and fry until soft and translucent. Take out with slotted spoon and put into blender. Add a tbsp of water if needed, and pulse until pureed. 2. In the same pan, heat the oil again, and add ginger/garlic paste and stir for a moment to heat up. Add the onion puree back, as well as all other ingredients except butter and cream. 3. Cook, stirring often, on medium heat, for about half an hour. The sauce will thicken and should be spoon-coating consistency. 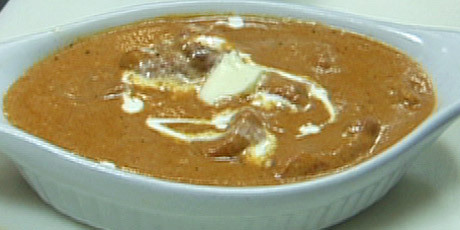 (If sauce becomes too thick, just add a little bit of milk to get it to the right consistency). 4. The sauce should be ready by the time the chicken comes out of the oven. Add the chicken to the sauce along with the butter and cream. Stir well and cook for another 5 mins. Spoon out into serving dish, garnish with a ribbon of cream and serve. 5. Note regarding tomatoes: Put the canned diced tomatoes through blender briefly. This will make a smoother butter sauce. Tomato paste is not a good supplement to this step as it has a much stronger tomato flavour and darker colour, which we don't want for this dish. 6. Note regarding cashew paste: To make cashew paste, soak 1 cup cashews in boiling water for ½ hour. Drain the water, and puree the cashews in blender. 7. Serving note: Ideally served with naan bread or basmati rice.